As the scandal over The Lancet's recent article, "Open Letter for the People in Gaza," grew at week's end, following NGO Monitor's discovery that two of the primary authors promoted an anti-Semitic video by white supremacist David Duke, NGO Monitor called on Dr. Richard Horton to take responsibility for his decisions as editor of the journal. NGO Monitor noted that, rather than retracting the letter and apologizing, Horton is coming to visit Israel this week. "The trip will not provide Horton immunity from the justifiable moral outrage of Israelis, the Jewish community, and medical professionals," said Yitzhak Santis, Chief Programs Officer at NGO watchdog group, NGO Monitor. "Nor will it absolve Horton of his responsibility to correct his politicized, non-scientific editorial distortions. If he cannot do so, he should resign," Santis said. In the past week, The Lancet and Horton have faced wide criticism after NGO Monitor's research showed that two of the authors of the "Open Letter" which appeared on July 23, 2014, also promoted the Duke video, "CNN Goldman Sachs & the Zio Matrix." Dr. Swee Ang sent out the video, which describes alleged Jewish control of "media, politics, and banking," saying that "the whole world needs to know." Another author, Dr. Paola Manduca, circulated Dr. Ang's email. Horton has cavalierly dismissed the incident, telling The Telegraph, "I have no plans to retract the letter, and I would not retract the letter even if it was found to be substantiated." Under Horton, The Lancet has become a platform for intense political propaganda, particularly targeting Israel. The "Open Letter" was not the first such article published under the facade of scientific rigor. 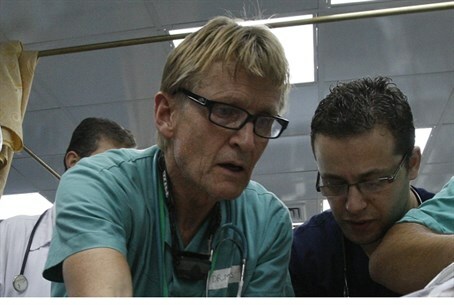 Dr. Mads Gilbert, another primary author of the "Open Letter" who frequently appears in The Lancet, has made comments justifying the September 11, 2001 attacks. In addition, The Lancet published an article by Dr. Swee Ang in February of 2009 titled "The Wounds of Gaza," replete with factual errors and defamatory accusations against Israel, such as "deliberate targeting of unarmed children." It was only taken down after 28 days. "Horton has tweeted that he aims 'to listen and to learn. And, quietly, to explain.' But, there can be no 'explaining' or justifying repeatedly turning The Lancet into a platform for individuals who promote antisemitic propaganda and other conspiracy theories," continued Santis. "His reputation, along with that of a long-respected medical journal, has been destroyed, and a visit to Israel cannot undo this lasting damage." The offending article drew ire from watchdog groups and medical experts alike for calling Israel's self-defense operation in Gaza "a massacre" and alleging that "95% of Israeli academics" supported what they claimed was "a military assault on innocent civilians." Several of the article's authors - who included Paola Manduca, Iain Chalmers, Derek Summerfield, Mads Gilbert, and Swee Ang - have been implicated in or accused of links to terror and extremist groups as well.